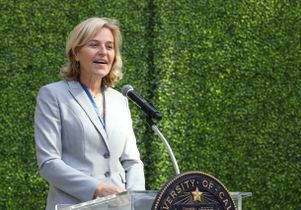 Entertainment executive and philanthropist David Geffen joined UCLA leaders on May 11 to dedicate Geffen Hall, the new home of medical education at UCLA. With UCLA Chancellor Gene Block and Vice Chancellor for Health Sciences Dr. John Mazziotta, Geffen snipped a ribbon in the building’s central courtyard as medical students, faculty and invited guests applauded. The facility — in use since January — leverages multi-media technology and promotes interdisciplinary collaboration to advance medical education. Geffen Hall’s teaching labs, lecture auditorium and exam rooms are easily adapted to different learning styles and new advances in teaching tools and curricula. In 110,000 square feet and six levels, the building also includes study spaces, a student lounge and administrative offices, among other features. 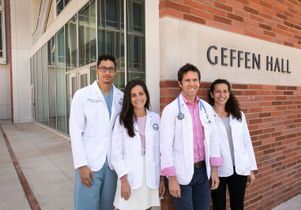 Geffen Hall was named in recognition of the extraordinary generosity and impact of Geffen’s previously announced gifts to the UCLA medical school, widely regarded to be among the nation’s leaders in research, patient care, medical education and community service. The medical school took Geffen’s name following a $200 million gift in 2002. Ten years later, he created a merit-based $100 million scholarship fund that pays tuition and all expenses for 20 percent of UCLA’s entering medical students each year. Among the students graduating in June are the first scholarship recipients. Geffen also donated $100 million to establish the Geffen Academy, an innovative middle and high school scheduled to open this fall on the UCLA campus. In addition to UCLA, Geffen is a benefactor for a wide variety of causes. They include, among others: AIDS Project Los Angeles (now APLA Health); the Academy Museum of Motion Pictures; the Los Angeles County Museum of Art; the Museum of Contemporary Art, Los Angeles; Geffen Playhouse adjacent to UCLA’s Westwood campus; the Museum of Modern Art and Geffen Hall at Lincoln Center in New York City; and the American Civil Liberties Union. As an entrepreneur and entertainment executive, David Geffen has made an indelible mark in the arenas of film, theatre, and most notably music. At the young age of 21, he launched Asylum Records. A decade later he founded Geffen Records, quickly building a superstar artist roster that included John Lennon and Yoko Ono, Guns N’ Roses, Aerosmith, Nirvana, and Elton John. Through the Geffen Film Company (also known as Geffen Pictures), Geffen produced such films as “Risky Business,” “Beetlejuice,” and “Little Shop of Horrors.” Geffen’s stage contributions include Tony Award winners “Dreamgirls” and “Cats.” In 1994, Geffen co-founded DreamWorks SKG, a live-action and film studio. Some of the studio’s top-grossing films include “Saving Private Ryan,” “Gladiator,” “A Beautiful Mind,” “American Beauty,” “Shrek” and “Transformers.” Geffen left DreamWorks in 2008. Mazziotta noted that Geffen’s career in entertainment relies in part on identifying and investing in talent. “We are grateful that he is now investing in our talented medical students,” Mazziotta said. Caroline Gross, a graduating scholarship recipient selected to represent medical students during the ceremony, presented Geffen with a gift — a mantle-sized replica of an inscription on a Geffen Hall pillar reflecting the scope of his philanthropy. Geffen Hall construction was funded through a combination of UCLA Health reserves and philanthropic gifts.